The Liberal Democrats have announced plans for a dedicated NHS and social care tax, but have stopped short of following the Green party and Labour in backing a national, free, needs-led system of support. Norman Lamb, the party’s health and care spokesman and a former social care minister in the coalition, told the party’s annual conference in Brighton that there was a need for a new tax – perhaps through an extra one pence on national insurance – to deal with health and care systems that are now “on their knees”. But he told Disability News Service (DNS) that the solution presented in a report on the impact of the closure of the Independent Living Fund by Inclusion London – a national, needs-led system, free at the point of delivery, and funded by taxation – would impose “very substantial costs to the health and care system beyond what the system is currently paying for”. He said of the parties that have backed that call: “They are talking about not just maintaining the current offer, they are talking about substantially increasing it. Lamb said he had heard “some really disturbing things” about disabled people having their personal budgets cut, with many organisations “expressing massive concern about support being undermined”, and local care providers in his area of Norfolk raising concerns about “what look like arbitrary decisions to reduce care packages, driven by financial necessity”. He said he was “horrified” by what was happening to social care. During the coalition years from 2010 to 2015, he said, “the NHS was protected and social care wasn’t”. Money was transferred from the NHS to social care to compensate for cuts in local government spending, but “because it was not ring-fenced, that money leaked out to prop up other local government services, so it didn’t work effectively enough to protect social care”. 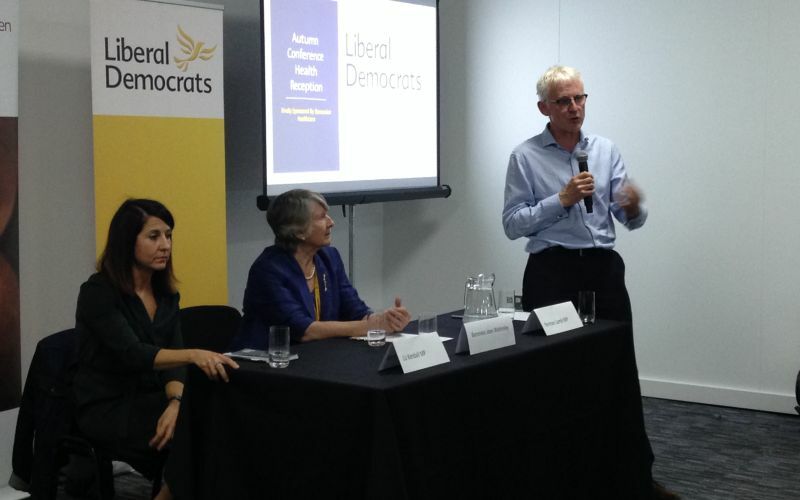 Speaking later (pictured, right), alongside Labour’s Liz Kendall (left) at a conference fringe event, he called on the prime minister to set up a cross-party commission that would “confront the growing crisis in the NHS and social care system”. In a joint statement, backed by former Tory health minister Dr Dan Poulter, Lamb and Kendall said there needed to be a “national conversation with the public and with healthcare staff about how we ensure a properly-funded and sustainable NHS and care system”. Lamb told DNS: “At the election, none of the parties came up with solutions to the scale of the problem. “Labour proposed cutting local government spending; we had nothing significant to say on social care beyond implementing [the recommendations of the Dilnot report] – which in itself was quite a significant breakthrough – but we didn’t have anything more than that, and the Tories had nothing at all. Lamb also announced that he had set up a panel of “independent health experts” to “consider the case for a dedicated NHS and care tax”. But he admitted to DNS that he had not appointed any disabled people or service-users to that panel. He said the suggestion that he should have done so was “an entirely legitimate perspective, so I am completely up for that”. Baroness [Sal] Brinton, the party’s disabled president, told DNS later that “if he has the capacity to expand it, he needs that [service-user] voice on the panel”. And he said there had to be a pooled budget for health and social care to provide an incentive to prevent ill-health and “deterioration of health”. He said in his speech to conference that the government’s spending plans would lead to a reducing percentage of national income being spent on health and social care “at a time when demand is rising by about four per cent a year”, which “just makes no sense”. And asked whether a call for a National Health and Independent Living Service could help secure more funds, he said: “I’m attracted by that sort of proposition because the terminology we use is unhelpful in the public discourse. Lamb’s call for a National Health and Care Service was backed by his party leader, Tim Farron, in his main speech to conference. Farron said: “If the great Liberal William Beveridge had written his blueprint [for a welfare state]today, when people are living to the ages they are now, there is no doubt that he would have proposed a National Health and Care Service. “He would have been appalled about the child who has to look after their disabled parent or the hundreds of thousands of women across the country who are unable to work because they are disproportionately the care-givers.